A truly extraordinary site. A huge set of stone circles set in a monumental landscape. Wander the avenue with us and imagine past ceremonies and celebrations. Step back in time into this 5,500 year old tomb. A beautifully situated and extraordinarily atmospheric site. The most enigmatic of our enigmatic monuments. The largest prehistoric man made mound in Europe. Another wonderful museum to be visited if time allows. Fantastic Personal Tour and Wonderful Laurence. Thanks so much for saying this. I had a wonderful time showing you all around and I am thrilled you enjoyed it so much. Thank you so much for saying all this. It was so great to spend two days with you all. What a lovely family you are and it was a real pleasure and a privilege to show you around. Thank you so much. It was great to spend the time with you and show you around. Thanks so much. I had a great time too. You were all terrific company. 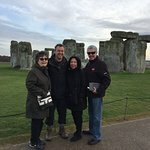 Get quick answers from Bespoke private tours of Stonehenge and Avebury by car with local guide staff and past visitors. Absolutely and Laurence is the man to show you the marvels of that area!